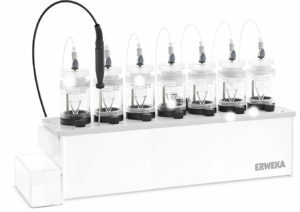 The new ERWEKA DFZ II, flow-through cell dissolution testers can be used for various applications thanks to its wide range of available cell types (e.g. for testing poorly soluble products or low-dose formulations with sustained release). The new DFZ II boasts innovations such as the new cell design with increased leak-tightness and the optimized tubing system with quick locks, allowing a fast preparation and implementation of dissolution tests. The new leaner cell bodies ensure an improved cell warming and can be heated individually. All USP 4 DFZ II dissolution testers can be easily controlled with the Disso.NET USP 4 dissolution software via a PC. Download the USP 4 Spec Sheet here. All DFZ II dissolution testers come with 7 test stations for different types of USP 4 cells (12.0 mm / 22.6 mm tablet cell, powder and granulate cell, suppository cell, implant cell, and more). Our cells now have a new, improved design, catering for different purposes – from the standard tablet cell to granulate & powder cells to cells for implants, suppositories and stents. 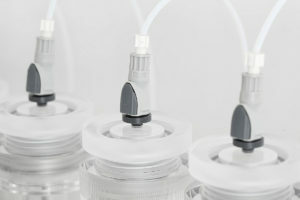 The new standardized cell head fits all other cell bodies along with the new standardized flat seals (only 3 pieces per cell: connection, head and heating jacket). The optimized cell bodies with decreased cell wall thickness guarantee an improved cell heating. Thanks to this new cell concept, the cells can be mounted easier to the new flow-through tester DFZ II and thus enable a faster preparation and performance of dissolution tests. The ERWEKA Disso.net software is the perfect 21 CFR Part 11 compliant companion to the USP 4 dissolution system. The software offers support of all USP / EP dissolution cells used in our USP 4 systems. It also supports cells for special applications (e.g. dialyse cell) and visual guides for formulation placing in the respective cells. Disso.net helps you with standard USP 4 dissolution jobs, handles qualifying tasks and provides control over each single function and connected device (e.g. connected pump, Flow-Through cell, sample collector and/or UV/VIS spectrophotometer). Our audit trail generates a detailed protocol recording all events and timings. The software includes an easy to handle method editor for highest safety in GMP environment. After finishing the dissolution test, Disso.net USP 4 creates reports with your corporate logo as PDF-files and/or exports your results as XML files. The ERWEKA stand-alone flow-through cell system is perfect for performing simple release tests with manual sampling. Therefore, the new flow-through cell dissolution tester DFZ II offers in a system with the ERWEKA piston pump HKP 720 and the ERWEKA heater DH 2000i an easy entry into testing with USP 4 systems for a small budget. 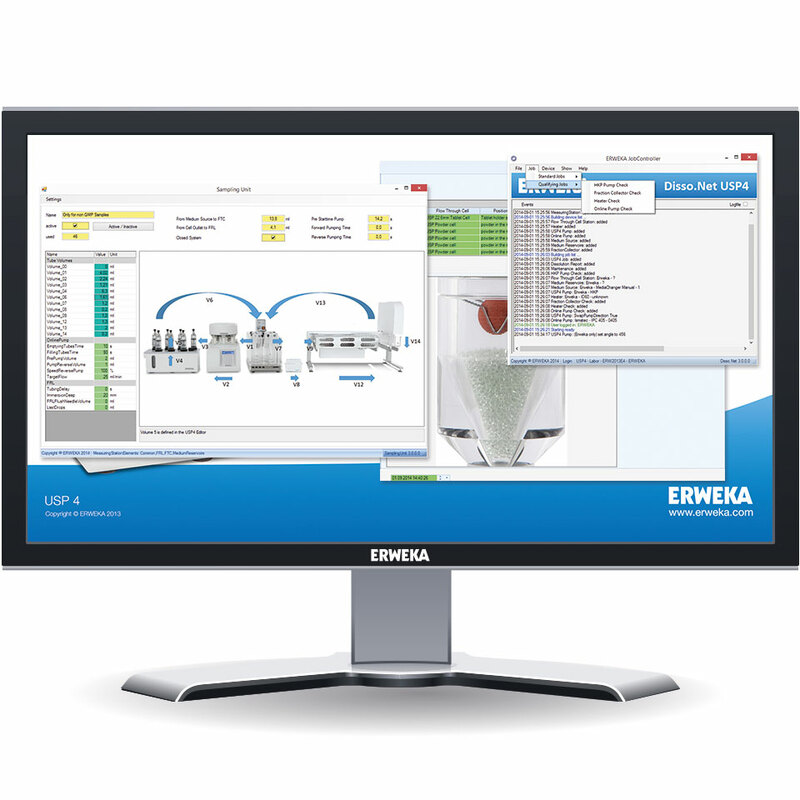 Infinite media testing and sample collection with the ERWEKA Open Offline Flow-Through System The Open System is the perfect solution for dissolution testers which require an unlimited supply of fresh media (e.g. low soluble drug substances). The sample collector FRL collects the complete or representative sample over a certain time for storage and later analysis. Due to integrated 3-way valves the system can automatically split for waste and sampling purposes. Extensive long term testing with the independent Closed Flow-Through System The Closed System is the perfect solution for dissolution tests which requires low media volume for long term dissolution tests and/or to increase sensitivity of the analytical method (e.g. implants).